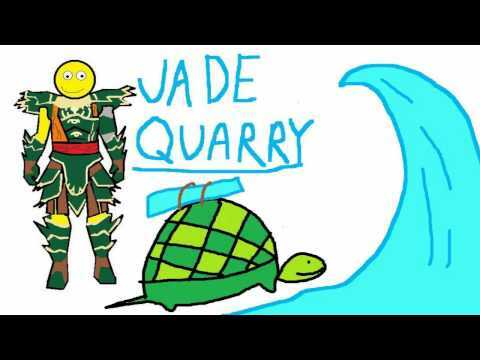 Many players from GW1 will remember the Fort Aspenwood and Jade Quarry game modes in pvp. For me, they were the most fun things to play as a casual pvper. There wasn't a ridiculous learning curve, communication was helpful but not completely necessary, and even though there were many PvE elements inside of it you still felt like you were playing a PvP game as the outcome wasn't influenced heavily by the npc presence. Blue team would be focused on defending 2 outer gates, 2 inner gates, and a main gate in front of the lord's room. Their goal is to protect the lord (Master Architect Gunther) until he finishes his grand weapon "Gods' Vengeance"
The only npc's in the match would be the lord (+ guards) and the siege turtles so there's limited PvE influence over the game mode (I'm looking at you stronghold) note: ALL npc's would be unaffected by stealth, swiftness, superspeed, and any shared invuln. They can be healed, given aegis, auras, etc. No point system (no points for player kills, objectives, etc.) the game's outcome will be completely dependent on whether blue team can defend their lord, or if red team kills it. No extra (or unnecessary) map mechanics like beasts, buffs, trebs, etc. Carriers would be unaffected by swiftness, stealth, superspeed, and invuln. They can be healed, given aegis, auras, etc. Would you like to see these modes come back to pvp? Why or why not? Are there other things you'd like to see make a return in GW2? Discuss! I loved Fort Aspenwood so much. It was my preferred pvp mode. I used to love gw1 pvp all aspects , n yes bring it all back to gw2 asap !